Do not buy Prepaid SIM card in Korea before check this out! What is the best prepaid and unlimited data SIM card for me? Unlimited data SIM? 4G LTE Prepaid SIM? or WiFi Egg? Almost near 5 years back, South Korea has been one of the inappropriate countries for tourists to buy prepaid SIM and use them in their phones while traveling. It was entirely due to 2G CDMA network (There’s no GSM network) and handset whitelist regime. At that time, all the mobile phones from abroad are required to registered before using it. But now, it is the best country offering best quality of mobile network that any visitors must experience. They adopted 3G WCDMA and 4G LTE global mobile technology standard in sequence. The quality and coverage of the LTE and WCDMA network is second to none in the world. It covers almost 99.9% of the whole region in South Korea with 4G LTE network, therefore it is not just a subsidiary option but a major tour package itself that is highly recommended to try. It is even leading the mobile 5G global standard now. Especially, top 2 telecom company, SKT(SK Telecom) and KT(Korea Telecom) eagerly try to advertise its technological superiority for the world. So, this article would like to share every checkpoint to enjoy mobile network in Korea such as what product to choose or what to be aware. http://prepaid-data-sim-card.wikia.com/wiki/Korea_(South) shows the general introduction but it’s not only too massive to effectively search or compare information or products nor hard to notice but it also displays meaningless products from A to Z and it makes users harder to choose. If there’s any missing points or anywhere needs modifications, it’ll be constantly updated in the future with continuous feedbacks so please feel free to comment your thoughts and opinions. I’ll focus on getting best products based on that. Most of the mobile devices made outside of Korea are available to use in Korea. As long as the device allows to plug in the USIM regardless of its USIM size or type, all smartphones, tablet PCs, routers or laptops are all available. The reason its size or type doesn’t’ matter is because almost of them comes in 3-in-1 type (nano, micro and general) and you can pick the size your device allows. (Most of the devices produced recently are made with nano size.) But to make it more securely, let’s keep those 3 in mind. The terminal has to be unlocked. No need to explain but literally make sure if the device you are willing to use is restricted to specific telecom company or specific country. If so, you can not use the device with Korean local SIM. But don’t worry. Most of the countries allow to unlock immediately by calling the current telecom company or production companies and offer them IMEI numbers of yours. Check the network techniques and frequencies. It is not working if your phone is CDMA base or doesn’t allow SIM card to plug in. Only devices with LTE or WCDMA that allows SIM card in it are available. Also if the device supports Korean LTE frequencies, you can use LTE. If it doesn’t support LTE frequencies, it’ll be connected to 3G WCDMA. Among those networks, SKT(SK Telecom) and KT(Korea Telecom) SIM cards for tourists are dominantly being used because of its frequencies. LG U+ is CDMA based and therefore it’s limited to work! So LG U+ are focusing more on WiFi router even at the airport booth. In this case, the SIM in the past could be still connected to the device so it may not be able to use with new SIM in. If newly purchased SIM is not working, you may be requested to call your previous telecom company and ask for deactivation. For your information, if it’s stolen devices or listed on a international blacklist, it is restricted to use. There are 3 ways to buy it. What you need to be aware is it is not absolutely impossible to purchase in town outside of the airport but pretty bothering. You can find some convenience stores like 7-11 in major places in Seoul or Haewoondae in Busan but you have to get to the store and in some case you may have language barrier. Best recommendable idea is buying from below 3 ways. It is not recommended to leave the airport with not getting the SIM card. In fact, below 3 ways are the most dominant for visitors or foreigners coming to Korea, which are 1) purchase online prior to the arrival and pick up at the airport, or 2) purchase at airport convenience stores after arrival or 3) getting the SIM card from the airport telecom company service desk. It is strongly suggested and cheapest way to purchase online prior to the trip and to pick it up at the airport after arrival. The most reliable and commonly used online SIM shopping mall is Korea SIM card( https://www.krsim.net ). Koea SIM card is highly recommended because it’s on market directly from the telecom company and has all the best SIM solutions for tourists with cheapest price reward system. And all the SIM products they treat offer 4G LTE premium full speed(Max. 150Mbps). From the actual experiences their CS is also very pleasant. No need to return after use. Roaming KT offers data unlimited plan and smartphone rental services in the airport but no premium 4G LTE is provided. There you can get only 5Mbps data SIM. Other than KT, there are other data unlimited USIM sellers getting their products from overseas tour agencies such as funko, trazy, klook, or kkday. But even though you order there, you will get the same product(kt 5Mbps unlimited data 5 days, 10 days and 30 days) with Roaming KT. In addition, it’s not only provided from Korean telecom companies directly but also complicated to get in touch with CS when needed so not recommended. Also you may see other online small distributor’s shopping mall such as linkkorea or neokoSIM, but some products of theirs are available only by visiting a specific offline store in town like Hongdae so not inconvenient enough as well. In case of EG SIM, it used to be widely used but currently it is extremely hard to get connected to CS center. It is easy to find people who cursing the company in Facebook of EG SIM. (It was also the starting point for me to start this posting). Still, I find so many blog articles that introduces EG SIM. I can clearly say it is outdated article and forget EG SIM. Please remember that if you can not find the information about data speed on the product detail page, it will offer just 5Mbps internet or below. If you haven’t purchased the SIM card online in advance, getting one from the airport convenience store is another great way to get. There’s no differences from other countries where you can easily buy SIM cards from continence stores. It makes your trip easier and recommended to buy from airport convenience store whereas online purchase is needed to finalize reservation average 1~2 days ahead of the arrival. Korea SIM Blue is on market and I was told that only 7 days and 15 days are available there. And recently Korea SIM Orange (5, 10 and 30 days) was released, too. You can get them even at the same prices in CVS downtown. The price is a bit higher than online purchase though. (About 20%). # Jeju International Airport : 7-11 on 3F. CU convenience stores on the 1F arrival floor in Incheon International Airport Terminal 1 are the most actively purchasable places. Likewise, once you’re arrived at the airport and need the SIM card urgently, it is also one of the good idea to visit the telecom roaming desk. There are different roaming desks from different telecom companies (SKT, KT, LG U+) but it’s very busy with many crowds all the time, so you may need to wait more than an hour. And there, it is much more expensive than online. Basically roaming centers sell unlimited data SIM card but if you want to use voice, you should set your credit card open for deposit and return the SIM after use, and pay extra charged if there’s any when you’re returning the SIM. Other than this they also have WiFi router rental and smartphone rental services. Here, I suggest the Best SIM in South Korea for foreign traveler. And online preorder is highly recommended. If you have a plan to arrive in Korea and to buy SIM in airport, it will be much more expensive and you can find few options to select. 한국어 페이지는 https://www.krusim.com 이며, 中文网站是 https://www.ktisim.com . The Best 4G LTE Prepaid SIM I think is ‘Korea SIM BLUE’ which has recently released. It offers unlimited 4G LTE full speed(Max 150Mbps) data, Korean mobile number which starts with 010- , local voice call 100 min. and 100 messages at a very rational price starting from US$ 22.9. With it, everyone can use his phone just like in his home country with world best high quality and all coverage in Korea. International outgoing voice calls are impossible, but receiving voice calls from anywhere are for free of charge unlimitedly. (In fact, there is no SIM for travelers that enable international outgoing voice call in Korea.) It also offers the most various period option products, 5, 7, 10, 15 and 30 days. Recently the price was set down from US$ 22.9 tempararily. Unlimited free for receiving calls and messages. All the mobile services including voice call, message and internet. 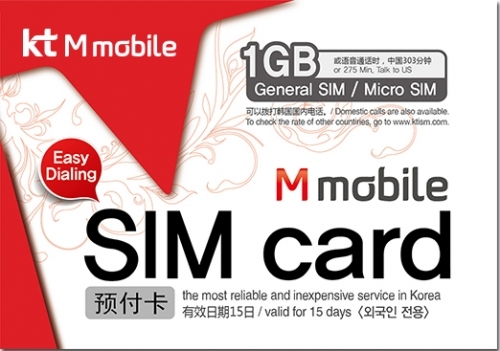 Available from Korea SIM Card ( https://www.krsim.net ) and offline stores such as CU or 7-Eleven. Recently(July 2018), Korea No. 1 telephone company SKT(SK Telecom) released new outstanding 4G LTE unlimited data SIM. It offers 2GB per each day + unlimited data at 400kbps. Moreover, there is no need to activate or register the SIM, so on insrerting the SIM, you can start to use without any other process. As far I know, there is no other SIM which requires no activation in South Korea. Above all, The price begins with USD 4.75! I don’t know when the price promotion will be ended. Also, you can enjoy Korean mobile number which starts with 010, and with it, you can receive voice calls from anywhere for free of charge unlimitedly. Have to make a security deposit, and return the device to have the deposit back. There will be a charge for a damaged or lost device. Online with easy purchase? or Offline in CVS in real time? In South Korea, it is obvious that major two SIM products from kt (Korea Telecom) have monopoly on the entire SIM market now. 4G LTE Prepaid SIM is available all around the airport and you can see everywhere including CVS. Moreover, Unlimited Data SIM is the most popular SIM plan. There is no need to recharge for Unlimited Data SIM. So, in this article, I would like to share how to recharge 4G LTE kt Prepaid SIM and how to check the credit balance. The minimum price for recharge is KRW 10,000 per 500MB. I think it is not that cheap, but it is totally worth for its world top class premium quality. For this reason, I would like to strongly recommend 2GB SIM instead of 1GB, if you need more than 1GB. This way, you can save KRW 5,000 with the same value of 2GB. Available at all time and easy to recharge. No need to face language barrier in front of your eyes. Simply enough with paypal or your credit card. Just visit https://www.krsim.net/product/additional-top-up/20/ and order. That’s it. This is a part of Korea SIM Card web page(https://www.krsim.net). But if you want to recharge during weekend or at night, it is hard to recommend because the recharge will be activated as of the next working day. However, it enables to recharge real time during operating hours in weekdays. Or you can also recharge at any convenience stores in South Korea such as 7-Eleven, GS25 and CU nationwide 24/7. It is truly real time recharge. 7-Eleven and GS25 have easier way whick you can simply show your phone number of the SIM and pay the desired amounts to recharge. All the credit cards are available for payment. You might experience language barrier but in that case, you can show the note below to the reception staff. Otherwise, CU has PIN code-based top up system. (customer top-up on their own) Once the staff is done processing, you will get a receipt with PIN codes printed (11 digits). Then call 080-013-0114 (for free of charge) and follow the message on the line. English instruction will be provided. When recharge is finished, you will receive notification message in real time. Call ARS 080-012-0114 (for free of charge). Then you will receive SMS that contains the information of the remaining credit balance. Or, you can call 080-770-0114 and ask the staff there. They will let you know the credit balance. All about prepaid SIM card, mobile solution for travelers to South Korea. It is even leading the mobile 5G global standard now. Especially, KT(Korea Telecom), the Official Olympic Partner eagerly tries to advertise its technological superiority for the world with upcoming Pyongchang Winter Olympic Games 2018. Among those networks, KT SIM cards for tourists are dominantly being used because of its frequencies. SKT has inconveniences to register your device information when activating, so it is rarely sold outside of the airport. LG U+ is CDMA based and therefore it’s limited to work! So both SKT and LG U+ are focusing more on WiFi router even at the airport booth. KT’s LTE frequencies use international LTE coverage (Band 3, Band 8, Band 1) and it can be used with no additional terminal registration issue. If you have used Korean prepaid SIM card in your device before! Some convenience stores like 7-Eleven in major places in Seoul or Haewoondae in Busan but you have to get to the store and in some cased you may have language barrier. Best recommendable idea is buying from those 3 ways. It is not recommended to leave the airport without not getting the SIM card. In fact, those 3 ways are the most dominant for visitors or foreigners coming to Korea which are purchase online prior to the arrival and pick up at the airport, or getting the SIM card from the airport telecom company service desk or airport convenience stores after arrival. It is strongly suggested and cheapest way to purchase online, make a reservation and pick up at the airport after arrival. The most reliable and commonly used online SIM shopping malls are Korea SIM card( https://krsim.net ) and roaming kt( https://roaming.kt.com ) now. Especially Koea SIM card is highly recommended because it’s on market directly from the telecom company and has KT’s every SIM solution (Premium 4G LTE SIM and unlimited data SIM) for tourists with cheapest price reward system. From the actual experiences their CS was also very pleasant. Roaming KT offers data unlimited plan and smartphone rental services in the airport but no premium 4G LTE is provided. Other than KT, there are other data unlimited USIM sellers getting their products from overseas tour agencies such as funko, trazy, klook, or kkday. But even though you order there, you be received same product(kt unlimited data 5 days, 10 days and 30 days) with Korea SIM card. In addition, it’s not only provided from Korean telecom companies directly but also complicated to get in touch with CS when needed so not recommended. If you haven’t purchased the SIM card online in advance, getting one from the airport convenience store is another great way to get. There’s no differences from other countries where you can easily buy SIM cards from continence stores. It makes your trip easier and recommended to buy from airport convenience store whereas online purchase is needed to finalize reservation average 2~3 days ahead of the arrival. CU convenience store at the 1F arrival floor in Incheon International Airport is one of the most actively purchasable places. Recently, Korea SIM Card at CU in Incheon International Airport was introduced in famous Korean TV program, ‘어서와 한국은 처음이지: France episode’ this week. Please check from 16 minutes. You can check how to purchase. Likewise, once you’re arrived at the airport and need the SIM card urgently, it is also one of the great idea to visit the telecom roaming desk. There are different roaming desks from different telecom companies (SKT, KT, LG U+) but KT is absolutely dominant for tourist SIM for foreigners as mentioned above. Again, SKT and LG U+ is specialized more on WiFi router rather than SIM card. In case of KT roaming desk in Incheon International Airport, it’s very busy with many crowds so you may need to wait more than an hour if need to. And there, it is a bit more expensive than online. Basically KT roaming center sells unlimited data SIM card but if you want to use voice, you can pay for the deposit money and return the SIM after use, and pay extra charged is there’s any when you’re returning the SIM. Other than this they also have WiFi router rental and smartphone rental services. Here, I suggest the Best SIM in South Korea for foreign traveler. You have to consider your preference when you’re choosing what to buy. First, the Best SIM I think is ‘4G LTE SIM from kt Mmobile’. With it, everyone can use his phone just like in his home country with world best high quality and wide coverage in Korea. It is not cheap price but fully worthy of it. It is clearly proud of its distinguished level from any other cheap SIMs. And you can never find any other plan that charge voice by second base ratio but this. With 1GB, you can talk 275 minutes to US. For call rate for other country, please refer to here. Second, for unlimited data SIM, I chose ‘the unlimited data SIM from kt(Korea Telecom). It is the best-seller SIM in Korea now. You can meet it through so many channels. In online, Korea SIM Card, funko, trazy, klook, and kkday all treat it and even you can even buy it at the kt desk on arrival floor in every International Airport. But I recommend you to buy it at Korea SIM Card. It declared Best Price Guarantee. And it is not one of distributors but also telecom company itself. So, You can trust customer services when in trouble. Available from Korea SIM Card ( https://krsim.net ) and offline stores such as CU, 7-Eleven. Unlimited data plan with rare voice calls? Its transmission speed 5Mbps is relatively slower than 4G LTE but as long as it’s not massive file downloading, it doesn’t bother to use. Available from Korea SIM Card ( https://krsim.net ) and offline such as KT roaming desks located in airports. Available from KT roaming desk online ( http://roaming.kt.com ) and offline airport KT roaming desk. 작성일자 2017년 10월 25일 글쓴이 카테고리 Unlimited Data and 4G LTE SIM in South Korea태그 4G LTE, airport, Incheon, Korea, Prepaid, SIM, South Korea, Travel, trip, unlimited dataLeave a comment on Do not buy Prepaid SIM card in Korea before check this out! 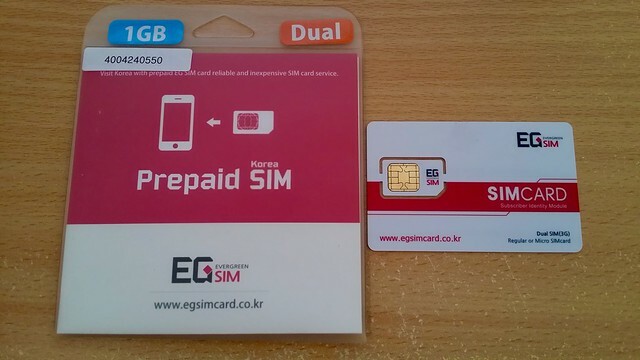 If you have been ever to Korea and have made choices for some prepaid SIM services for foreigners in the past 3 years, I guess that you may have heard the SIM card which is called “EG mobile”. It is the name of the company, that started prepaid SIM business for foreigners about 3 years ago, in 2013. It concentrated on the sales in shops around Incheon Int’l Airport, Korean convenience store GS25, (in offline) and internet open market shop (in online). At that time, there were no competitors in the market and the contents they provide was reasonable to the price. It was so small company that it didn’t worry about Korean government regulation which was not determined at that time (what condition must legally be fulfilled to activate the prepaid SIM for travelers… and so on), and invested aggressively in marketing their products whereas the potential competitors hesitated to enter the business worrying the uncertainty in policy and waited for the decision regarding the market regulation. Sometimes it was recklessly too brave to offend the government. Anyway, as the result, it became the name of prepaid SIM in Korea, itself. It’s the reason why you encounter the name so often in Google search results about prepaid SIM in Korea. But as time went by, the direction of government regulation became somewhat concrete. At last, the subsidiary company of “kt” (korea telecom; the no. 1 telecommunication company who has the most subscribers in S. Korea), “kt Mmobile” began to play in the market and to take up the position in 2015. They have supplied their kt Mmobile SIM card for travelers to the Korean major 2 convenience stores, the Seven-Eleven(7-11) and CU since then and opened internet shopping site, krsim.net, too. Finally, travelers have become to enjoy the trustful services that the Korean top telecommunication company provides. On 1st. March, 2016. GS25 came to be out from the Arrival floor in Incheon Int’l Airport and EG mobile lost the place to sell their products there. Now the Airport has only three CU convenience store there, so kt Mmobile SIM card comes to be the most dominant and popular prepaid SIM card for traveler in S. Korea, now. What is the way to be connected in Korea as a short-time travelers with your smartphone, now? There are so many articles that compare one with another. But I found that the information they showed was so out of date that it could mislead travelers rather than helped them. I had been a researcher (as to Korean mobile telecommunication policy and industry sector) in the public institute for over 10 years, and am following the issue. Recently prepaid SIM market for travelers seems to be growing rapidly and catch my interest. Then, what on earth is the best prepaid SIM in S. Korea for travelers? Let’s find the answer from now on.